Uölker Sneakers and Co is based in Born, among many other well designed shops. The name says it all; it is dedicated to many colourful sneakers. The owner has a real passion for it, as to him it is not just a shoe, it’s a part of you, of your life. It contains a bit of passion, fashion, heritage, colour and many more ingredients. The great window display always catches my eye and the contrast of the sober wooden design and the bright, colourful selection of shoes draws me inside. 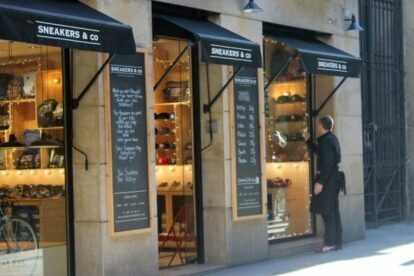 If you love sneakers then make sure you check out this shop, as they have a wide selection of the most famous brands. Guys, girls and kids can find the latest trends when it comes to sneaker fashion. And, to be fair; who can go for a day of Barcelona sightseeing on a pair of heels? You’re better off with a pair of comfy and fashionable sneakers for sure!